The first article in a series of three, which reports the results of a study conducted by IMA and BASF to evaluate the performance of Perfima Edge in a pellet coating process. IMA Active’s wedge wire screen drum can be fitted into the standard Perfima equipment. The result: Perfima Edge making side vented pan coating accessible for small particles like pellets. Wedge wires have a round and smooth shape for being as gentle as possible to the product while simultaneously improving flowability. The dedicated design of the drum allows high process air volumes, consequently resulting in high spray rates and economical short process time, similar to conventional perforated drum coaters. Compared to the fluid bed technology, Perfima Edge provides two main advantages: firstly, it comes with a much smaller footprint, and secondly, the spray guns are readily accessible during the process. Additionally, drum coating processes can easier be controlled simplifying up-scaling procedures. From the product’s perspective, both technologies fluid bed and Perfima Edge provide coated pellets of equal quality and performance. When deciding on a particular coating technology, one has to consider quality and economic efficiency of the process as major aspects. Consequently, process time and coating uniformity of the final product have to be considered. Especially within the realm of functional coating and/or drug layering, this question is of outmost importance. The aim of this study is to evaluate Perfima Edge coating technology in terms of efficiency in a pellet coating process to achieve functionality. Pellets (20-25 mesh, IPS, Milano, Italy) consisting of sucrose and microcrystalline cellulose were used as substrate. As tracer, Riboflavin (BASF, Ludwigshafen, Germany) embedded in a film of PVA-PEG graft copolymer (Kollicoat® IR, BASF), was applied (Table 1). The functional coat was based on Kollicoat® Smartseal 30 D (BASF) – a polymer delivering taste masking functionality due to its pH dependent solubility. Further components of the formulation (Table 2) were: FD & C Blue No. 1 (BASF); acetyl tributyl citrate (ATBC, Jungbunzlauer); buthylene hydroxy toluene (BHT, Sigma-Aldrich) and talc (Merck). Due to surface effects of Riboflavin, the tracer formulation had to be applied with a solid matter concentration of 15% only. The solid matter content of the formulated Smartseal dispersion was 20%. 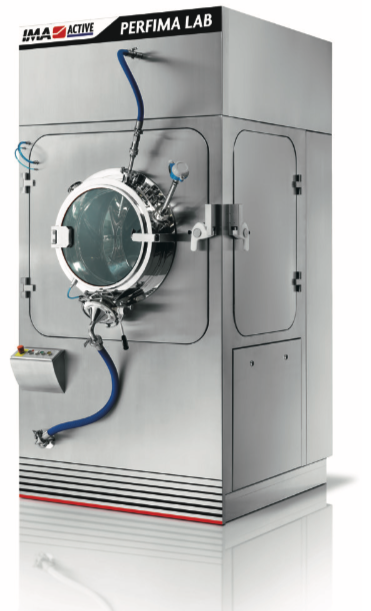 Perfima Edge, IMA’s side vented pan coater (SVP) equipped with wedge wire screen drum (specifically designed for coating of small substrates such as pellets), was used in this study. All trials were conducted in pilot scale equipment. Small wedge wires are fitted into the drum to allow the passage of air during the process. The equipment maintained the same drum shape, drum geometry and spray system of the standard equipment for tablet coating. To handle all types of substrates in regard to shape and size, specially designed mixing baffles were welded to the center and the side walls of the drum. The coating trials were conducted according to schema reported in Table 3. To allow a distinct investigation on the coating level, the individual amount of applied coat was determined by photometrical measuring of either Riboflavin or of the colorant FD&C Blue No. 1. For the dissolution test standard equipment according to Ph. Eur. is used. As the taste masking functionality is to be delivered in the oral cavity, phosphate buffer (pH 6.8) was used as dissolution media. Hereby, the criterion for a fully functional coat was that no drug release was seen for a period of 2 hours. The weight gain of the pellets was calculated according to the equation in Figure 1. In a first coating step, Riboflavin was applied as a tracer for the dissolution testing. The achieved weight gain revealed optimal performance as showed by employing standard deviation as scale for content uniformity (Table 4). Kollicoat® Smartseal 30 D based formulations have to be applied onto tablets with a typical coating level of 3.5 mg/cm2 to gain full functionality (meaning no drug release for 2 hours in neutral media). 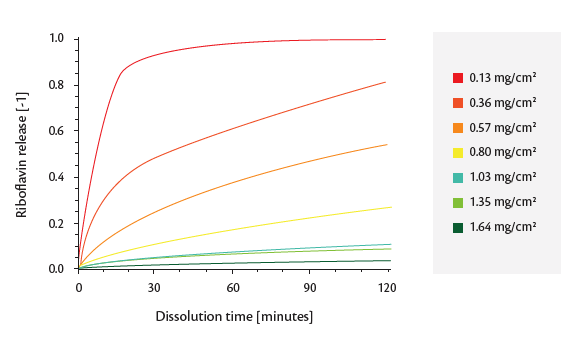 When applying a comparable coating formulation (Table 2) onto pellets, full functionality can be achieved with distinctively lower coating levels (Figure 2). Due to the excellent mixing properties of the baffles fitted on Perfima Edge, the release profiles become more and more similar at higher coating levels. This demonstrates that both coating performance and efficiency will be equal eventually. Perfima Edge coating equipment with its small footprint is a space-saving alternative to fluid bed technology. Its design allows optimal accessibility of the processing area. Furthermore, up-scaling is easy and fast. For all these reasons, IMA Active’s wedge wire screen drum is a promising and efficient technology, enabling to coat into the same pan cores of different size and shape.